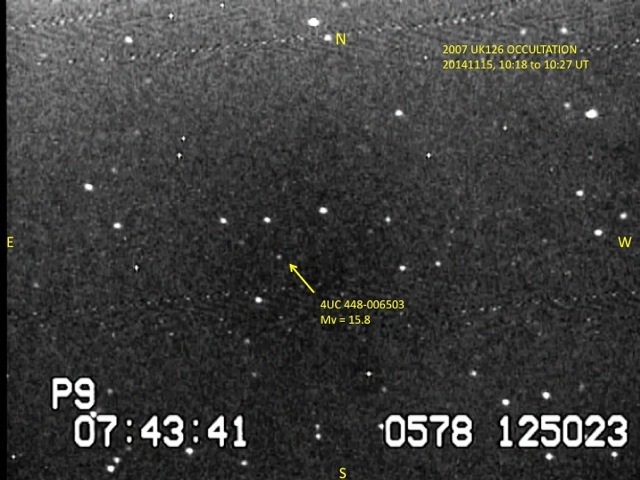 We’re entering the next phase of the RECON Project – observation campaigns of KBOs out past Neptune!!! 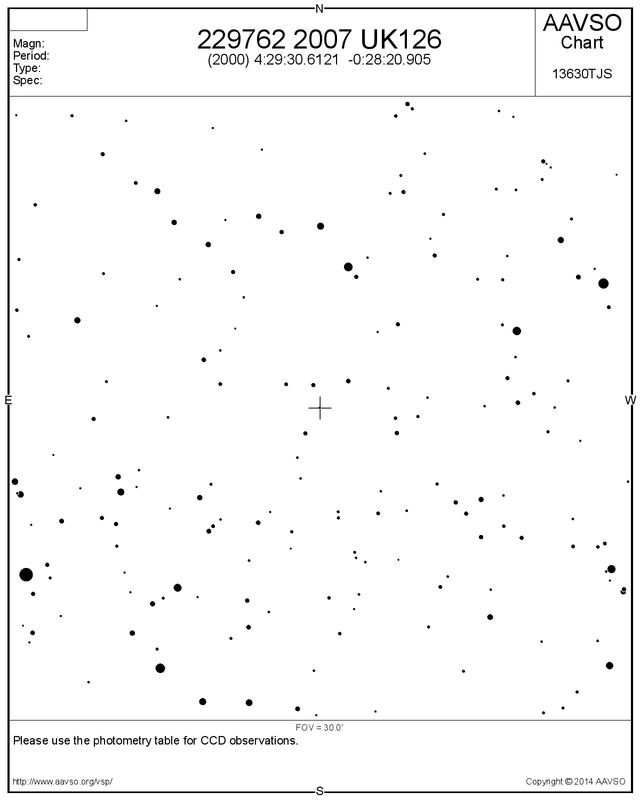 On Saturday morning, November 15, around 2:20 AM, 2007 UK126 is predicted to pass in front of star 4UC 448-006503. 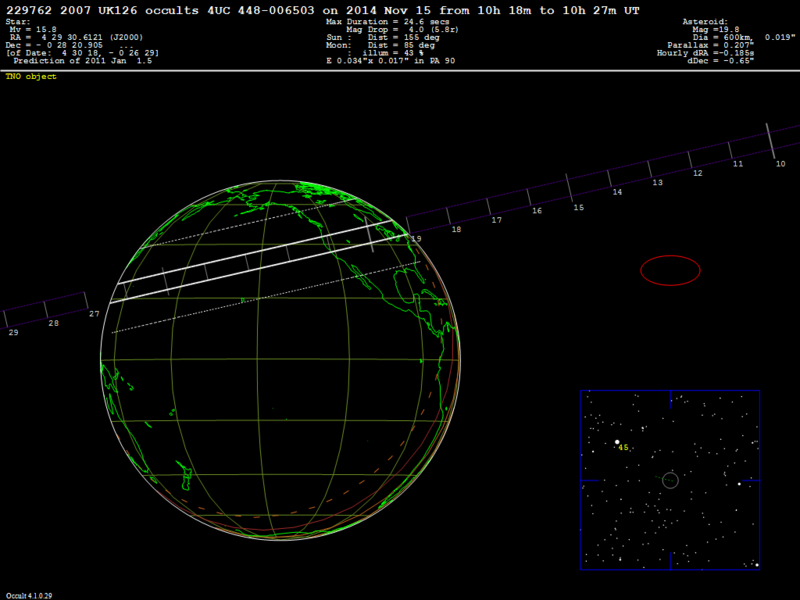 As shown in the diagram below, the shadow path is centered over North America and the RECON Network. Please sign up for this event on Occult Watcher. Predicted path for KBO 2007 UK126. Note 1-sigma uncertainty typical of TNOs. Note also that the 1-sigma uncertainties on the shadow path are much larger than for the main belt asteroids we have observed previously. This is why we need a full RECON network that stretches 2,000 km across the Western US. However, for now this event represents an EXCELLENT opportunity for the pilot RECON network to demonstrate the capability of the network to record data very similar to future events when we have the full network. 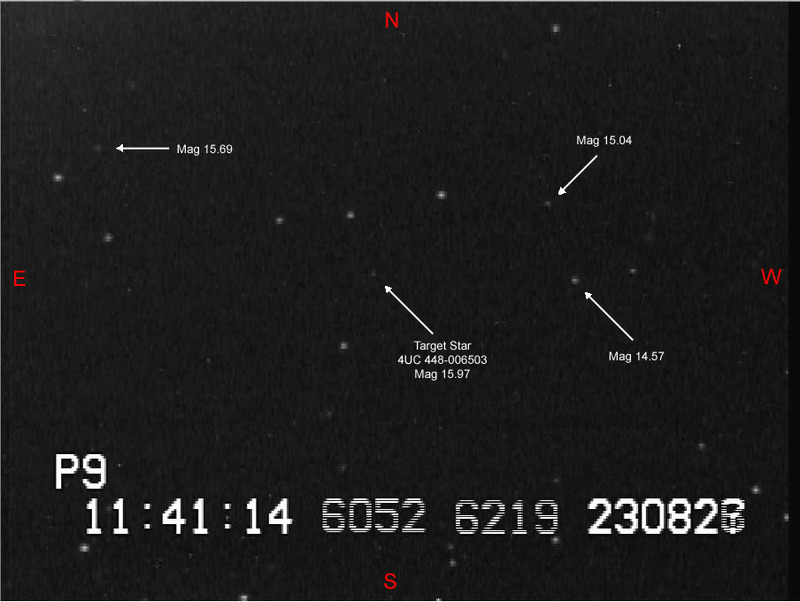 The event will also test the sensitivity of our camera system; the target star we will be using is very faint (mag 15.8). For more information on this event, visit Global TNO Events Page and scroll down to the listing for the event. Due to the uncertainty in the prediction time, teams should record 20 minutes work of data from 2:10 – 2:30 AM. Data should be split into four 5-minute recordings to limit the file size for each. Either before or after the event, you should also make a short recording of your position information using the switch on the front of the IOTA-VTI box. Adjust the switch to POSITION, record the screen showing your latitude/longitude for 3-5 seconds, and then adjust the switch back to TIME. Thank you for keeping track of your observations using the RECON Observation Logsheet. To upload your video files and observation logsheet, go to http://spikard.boulder.swri.edu/upload.html. Following the event, please let us know how it went using the form below. To view survey responses, view the Results Page here.